The oldest form of human communication in the world. The origin of the Sanskrit language. The Vedas are ancient hymns of poetry held in an extremely specific sound frequency (shruti). Traditionally passed on orally until the dawn of the present age. 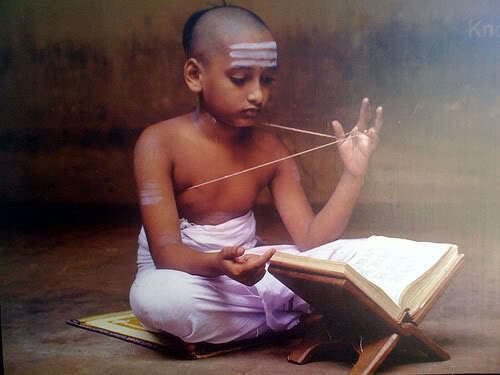 Thus, they can be learned only by hearing from a qualified Vedacharya. The Veda is the root of all knowledge. Anything that can possibly be known by man can be found in the Veda. These ancient texts prescribe a system of divine living based upon the universal law of creation. This law is known as Sanatana Dharma, or the Eternal Way. The following 5 suktams will be taught over the course of 2 1/2 months. They are taken from various chapters of the YajurVeda. This collection of mantras goes hand in hand with the Nitya Karma classes and is designed to give the student a method of real-life application. Students are encouraged to attend Nitya Karma first in order to learn the proper discipline of the study of Vedic Mantra.